I cannot grow Aruncus aethusifolius — commonly called dwarf goatsbeard — a hardy, petite, lovely perennial native to Korea. Lord knows I have tried.It’s a small yet striking plant, with rich green, finely divided foliage resembling intricate lacework. 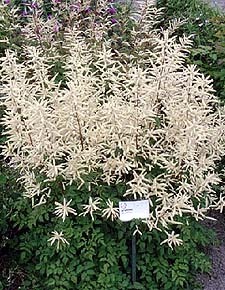 In early summer, creamy white flowers dance on dainty stems rising less than 12 inches above the tiny, perfectly proportioned leaves. Small, dark seedpods form if the spent blooms are allowed to remain, offering a delightful contrast to the lovely reddish tone attained by the foliage in the fall. Or so I’m told. The first five dwarf goatsbeard I purchased and planted in the spring four years ago neither bloomed in early summer nor lived to feel autumn’s cool breeze. They started out green enough, until the day in August I noticed each of them curled up tight, brown as a paper bag. So sudden and thorough was their demise I gasped. A review was in order. The plant prefers part shade. Simple enough; part shade is the only growing condition found on my wooded half-acre. As with nearly every perennial known to God and gardeners, dwarf goatsbeard prefers soil amended with organic matter. No problem there; so fastidious is my soil preparation that even my son’s sandbox is amended with organic matter. Further, the soil should drain well, so as not to hold moisture too long throughout the root zone, which perfectly describes every inch of the soil surrounding the five doomed plants. Each plant had been fertilized lightly, at the proper time. All I could think of was that I’d planted them at the edge of a bed in my front yard that borders the road. Latent effects of road salt from winter! Of course. The next spring I planted five, healthy Aruncus aethusifolius in perfect soil in the perfect spot, a newer bed far from the road. They bloomed magnificently in mid-June, began yellowing in July, and were little more than expensive, composted soil additives by August. Hmm, then aha! Even though I had not watered the plants any more lavishly than the surrounding polemonium, pulmonaria, or heuchera, a yellowing slide into death is a sure sign of over-watering. I had learned something; dwarf goatsbeard prefers things a bit on the dry side. At last I knew. The third time would be the charm. So the next year when you water a plant a bit sparingly and it exhibits exactly the same death wish, except for dying a few days later than the previous batch, it means what, exactly? The soil pH is out of whack? You’re absolutely right. Except results of a test of the soil that had so callously killed my third round of dwarf goatsbeard showed a pH of 6.5, which is, of course, perfect for a majority of perennials we grow in the north, and plenty good for goatsbeard. At least the problem was now clear. “Prefers part shade” is so arbitrary. Obviously, the plants were not getting enough sun. So last year I planted five more of the little darlings in a backyard bed that receives dappled shade morning and late afternoon, but includes around four hours of direct, midday sun. One expired audibly at time of planting, two bloomed and then died, and the final two bloomed sluggishly before limping into fall. In late September the foliage on each survivor made a brief stab at exhibiting the reddish hue I’d read so much about, before fading, then dropping to the ground. This spring, no trace of the plants could be found. I will buy no more Aruncus aethusifolius, even though I’ve seen it growing like a weed in other properties around the Twin Cities. I’ve spied it in sunny rock gardens, seen it sprawl effortlessly as a groundcover in shade, always blooming like mad, and in the fall turning red as hell before returning the next season twice its size. One of gardening’s cruelest truths is that there are certain plants others can grow, but you cannot. There’s a reason, an answer, somewhere, but I give up on plants that mock me. But by all means, grow it. You probably can.